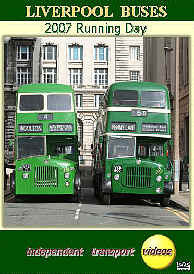 Join us on this DVD programme for a ride back in time on board some preserved former Liverpool buses. Thanks are due to the Merseyside Transport Trust for organising a Running Day covering a selection of routes in Liverpool that these vehicles previously operated on. We start the day at Liverpool Pier Head, formally a busy terminus for both Liverpool Corporation and Crosville buses. We film the vehicles arriving and taking up their duties. All the services on the day serve the Penny Lane terminus and pass through Woolton and the spectacular new Liverpool South Parkway bus & rail interchange - which the Running Day is centred upon. Our first journey of the day is onboard A267 (VKB 900), a 1957 A.E.C. Regent V with MCW Orion body. All the sights and sounds are captured as we head along to the famous Penny Lane, then onto Parkway via Woolton. We then board L501 (501 KD) Liverpool’s first Leyland Atlantean. Built in 1962 with an MCW body you can experience the difference as we travel to Pier Head via Woolton and Penny Lane. After a review at Pier Head we board ‘Jumbo’ Atlantean 1111 (UKA 562H) for a journey to Parkway, this time via Penny Lane and Woolton. Our third ride is on 1836 (TWM 220V) a more ‘modern’ AN68 type. Sporting an East Lancs body this bus is in the later Merseyside Transport livery of verona green, cream and brown trim. Our final run down to Pier Head is a real treat. We leave Parkway on L255 (VKB 711) a 1956 Leyland PD2 with Crossley body, changing to A267 at Penny Lane. During this journey most of the filming is done from the rear platform recording the following vehicle – plenty of action here! The day closes with the final arrivals and departures at Pier Head. A truly magnificent day professionally organised by the Merseyside Transport Trust. So sit back and relive the day!